I read A Sparrow’s Flight years ago when I was staying with my sister who lives in France. I have been looking in charity shops for a copy ever since. Then I thought, Why not try Amazon? And I got a hardbacked copy signed by Hailsham for a modest price. 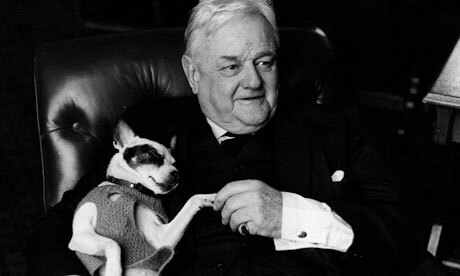 Lord Hailsham, Quintin Hogg, was born in 1907, and was a leading, courageous, intelligent, humane and colourful Conservative politician (to how many politicians is that string of adjectives applicable?) from the late 1930s to the late 1980s. He was a remarkable big, unconventional, all-round person, lawyer, politician, thinker, believer, adventurer, who could tell stories, sad and funny, and reflect on their meaning. We get all that in this autobiography. I wanted to read it again because two things stuck in my memory. One was the account of his last conversation with Winston Churchill, about life after death. The other is his own poem, The Sparrow’s Prayer (p 493). Here Hailsham weaves together two ancient texts he puts at the front of his book. The first is a story in Bede’s Ecclesiastical History of the English People, written in Wearmouth in the 8th century. The present life of man, O King, seems to be like the swift flight of a sparrow through the room wherein You sit at supper in winter, with your commanders and ministers, and a good fire in the midst, whilst the storms of rain and snow prevail abroad. The sparrow, flying in at one door, and immediately out at another, whilst he is within, is safe from the wintry storm; but after a short space of fair weather, he immediately vanishes out of your sight, into the dark winter from which he had emerged. So this life of man appears for a short space, but of what went before, or what is to follow, we are entirely ignorant. He concluded that if this new Christian religion offered help with this basic problem, they should go for it. And they did. What help does Christian faith really offer with this problem? Christians are still ignorant of much that goes before, and much that will come after. It does not help to claim to know more than we do. We have more chance of knowing a bit while we are in the light. God the Father in Jesus Christ shines light now in the ‘short space’ of our present flight. Faith in God does not lead us to speculate about before and after, and then to pretend to have knowledge, when all we have is ideas; instead, it gives us life to live now with all we can give. Despite all the destruction and malevolence of the world, I do not believe in a malevolent deity. I do not believe in an irrational universe. I believe in goodness, truthfulness, loving kindness, beauty, generosity, loyalty. They all exist and are qualities which demand just as much explanation as malevolence, mendaciousness, cruelty, ugliness, meanness and treachery. Are not two sparrows sold for a penny? Yet not one of them will fall to the ground without your Father…So do not be afraid: you are of more value than many sparrows. Out of this material, and with this humble faith and intelligence, Hailsham made this prayer of penitence and hope, summing up his life as the sparrow seeking mercy not justice. And looking beyond being a broken sparrow to the lark, a bird that is not mentioned in the Bible, but sings faith and joy invisibly on high. Next post: Romanian Visitors Arrive!